Those of the name O Cannon of Gaelic origin (as opposed to McCannon) were also differentiated by MacLysaght from two others of different extraction; those of English extraction who bear a common English surname derived from the ecclesiastical word ‘canon’ and those of Huguenot extraction, descended from French Protestant refugees. Maine Mór and his descendants appear to have subjugated many of the existing tribes and peoples that inhabited their land and established a petty kingdom, covering much of the later east Galway named from their progenitor as Uí Maine (later Anglicised Hy Many). The descent of Ua Canain was given more specifically from a junior sub-group of the Uí Maine known as the Síol Anmchadha (ie. ‘the seed or progeny of Anmchadh’). 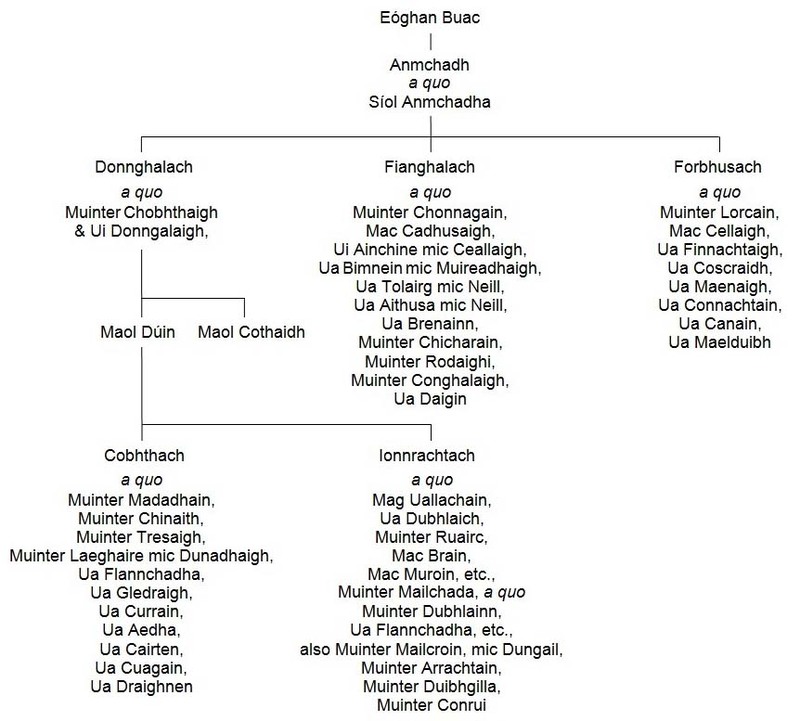 Pedigree showing the descent of Ua Canain from Forbhusach son of Anmchadh and the inter-relationship of the Síol Anmchadha, derived from the Book of Lecan. 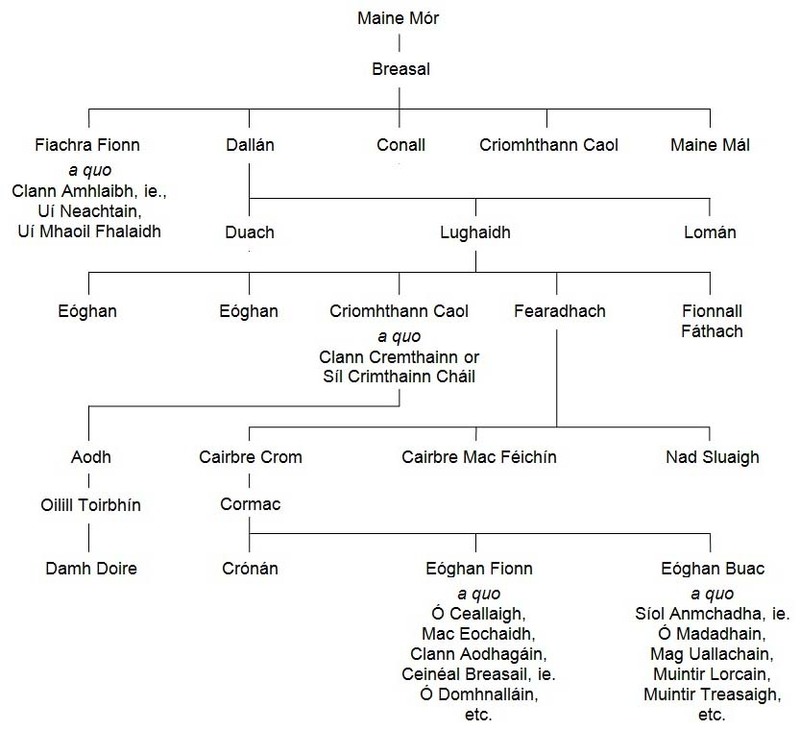 MacFirbisigh’s genealogy of the Síol Anmchadha gives Forbhusach as junior to Donnghalach but more senior than Fianghalach. The territory of Síl Anmchadha that came to be ruled by the O Madden chieftains was located in the east of what would later be known as County Galway, and equated for the most part with the barony of Longford in east Galway. However, not all of the lands associated with all of those families descended from Anmchadh were located within Síl Anmchadha and no specific ancestral lands either within or without that territory in County Galway can be ascribed to the O Cannons in the medieval, late medieval or early modern period. The name seldom clearly occurs in early records and no member of the name was given as a significant landed proprietor of land in the county in the early or mid seventeenth century. Although MacLysaght described the name in the mid twentieth century as almost extinct in County Galway, one hundred years earlier, in the mid 1850s, there were approximately forty-one households of the name Cannon in County Galway, for the most part located in the east and south-east of the county. [i] MacLysaght, E., Irish Surnames, Their Names, Arms and Origins, Fourth Edition, Dublin, Irish Academic Press, 1985, p. 52.